Notes: Colored, underlined words are HTML links. Click on them to see the linked posts/articles. Forwarding this and other posts to relatives and friends, especially those in the homeland, is greatly appreciated). To share, use all social media tools: email, blog, Google+, Tumblr,Twitter,Facebook, etc. THANKS!! We who have the curiosity to explain and understand the world, love to study history. In our specific world (history of us native Filipinos and our homeland), we look at our historians --many foreigners then and now, Spanish and especially Americans-- much of whose collections/narratives and judgments of facts have shaped our native outlook through their lenses. Thus and most important, we need to critically evaluate their judgments about what is true and what is significant. 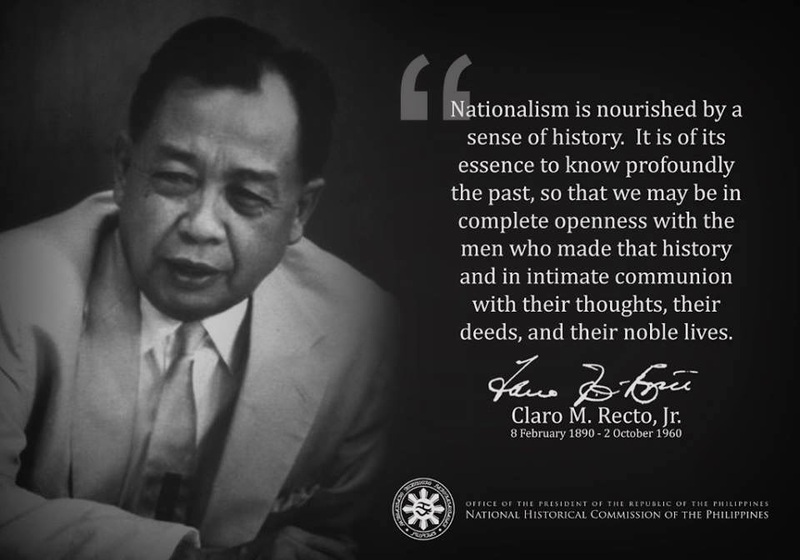 Thankfully in recent decades, we have had native historians, though much fewer, who have critically studied, written and judged our history from a native Filipino, nationalist point of view. [ In the months following the Spanish-American War, the winds of expansionism blew strongly across the United States. There was a lot of talk about Manifest Destiny and many people suggested that America should assume its role as a world power. In Congress, legislators called for the annexation of all Spanish territories. Some newspapers even suggested the annexation of Spain itself. Expansionists such as Theodore Roosevelt, former President Harrison, and Captain Mahan argued for creating an American empire. Others, including Grover Cleveland, Andrew Carnegie, and Mark Twain, opposed these ideas. In October 1898, representatives from Spain and the United States sat down in Paris to work out a treaty. President McKinley appointed a "peace commission" to represent the United States. A majority of the commission's members believed in expansionism. No representatives from the colonies whose fates were being decided attended the Paris conference. The Spanish delegates assumed that the United States would annex Cuba. They suggested that the United States also take over Cuba's $400 million debt. The Americans declined. After all, the war had been fought in support of Cuban independence. However, they were glad to accept Puerto Rico, Guam, and the Philippines. The American army already controlled the city of Manila, but it had not ventured into any other areas of the Philippine Islands. After signing the treaty, President McKinley ordered the War Department to bring all the islands under military control. The people of the Philippines, he decided, were too "uncivilized" to govern themselves. The Filipinos were shocked. For two years they'd been fighting for their independence from Spain. Since the United States had supported rebels in Cuba and Hawaii, they expected support for their independence as well. Commodore Dewey wrote to his superiors and pointed out that the Filipinos seemed better prepared for self-government than the Cubans did. The War Department responded by sending more men and equipment to Manila. The Lord Said: "Keep the Philippines"
The Treaty of Paris between Spain and America conferred on the latter an almost untrammeled powers where us Filipino natives were concerned. It placed the islands under U.S. sovereignty. Although Article IX of the Treaty stated that.." the civil rights and political status of the native inhabitants shall be determined by the Congress..." In practice, it was not to be so. As then Secretary of War Elihu Root declared: "...that the people of the islands have no right to have them treated as states, or to have them treated as the territories previously held by the U.S. have been treated; or to assert a legal right under the provisions of the U.S. which were established for the people of the United States themselves..." (from The Military and Colonial Policy of the United States: Addresses and reports by Elihu Root, Harvard University Press, 1916, p.161). The Treaty of Paris, which ended the brief, 4-month Spanish-American War and ceded the Philippines to the United States. was signed in December and awaited confirmation in the U.S. Senate, which required a two-thirds majority vote. When the U.S. Congress the pro-annexationist faction held a clear majority, but were one or two votes shy of the 2/3 majority requirement.. Voting was scheduled for February 6, 1899. To observers,the McKinley Administration did not have enough votes, which placed the American retention of the Philippines in jeopardy. That the outbreak of the Philippine-American War was carefully orchestrated to influence the outcome of the Treaty vote in the Senate seems almost beyond question. The big news of the fighting and the false information as to its instigation was wired to Washington and its dramatic effect persuaded the Senate to ratify the treaty by a margin of one vote. I am reminded of the later Gulf of Tonkin Incident (1964) that was a lie fabricated by the Johnson Administration to gain Congressional support for the expansion of the American (intervention) War from South Vietnam to North Vietnam.